A winning moment? 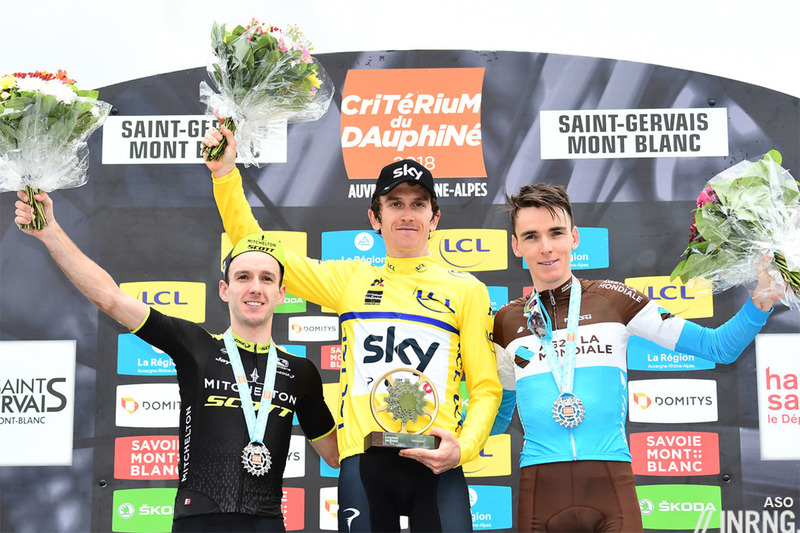 The team time trial gave Geraint Thomas a big cushion of a lead, almost a hammock to swing in but he confirmed as soon as the race reached the mountains that he could rival the pure climbers, including at Valmorel where he jumped away once the road flattened out take time on Adam Yates and Romain Bardet, his principal rivals and again at La Rosière, taking time and time bonuses. The prologue set the tone for things to come with Team Sky dominating the stage, Thomas might have won were it not for his crash and it looked obvious Sky would win the team time trial and by some margin, to be expected given the wage bill of their starting eight riders exceeds the annual budget of entire teams in the same race. The race didn’t offer much for the sprinters. 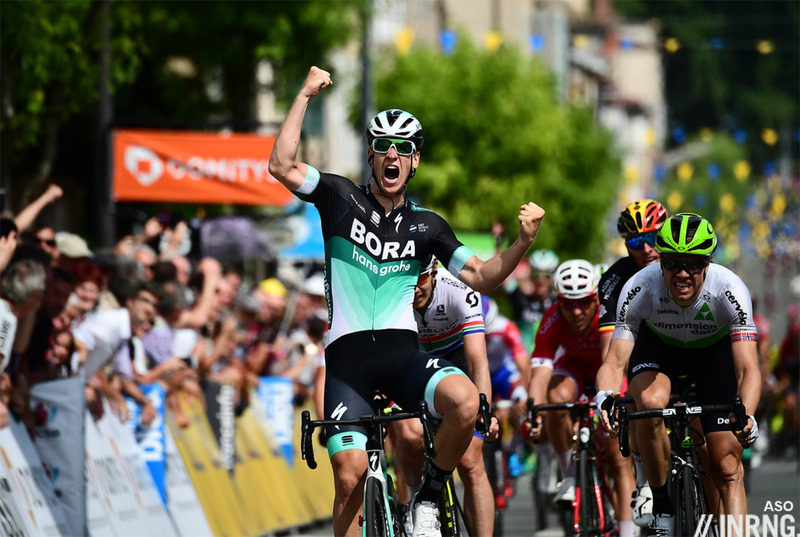 Pascal Ackermann took the stage to Belleville to add to the options Bora-Hansgrohe enjoy with Sagan and Bennett while Emanuel Buchmann had a great race too, climbing with the best and not far off a stage win and it’ll be interesting to see him linking up with Rafał Majka in July in the Vuelta next. 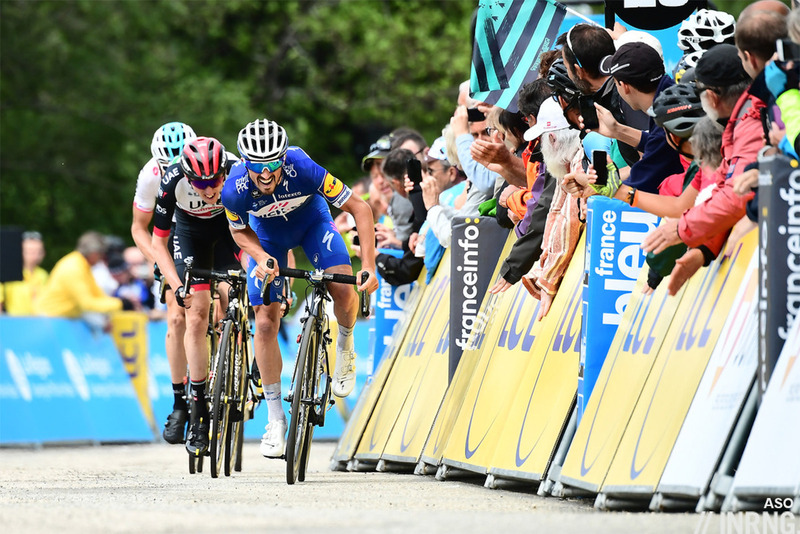 Julian Alaphilippe won in the Vercors, the short final climb allowed him to use his explosive jump to get the better of Dan Martin, Geraint Thomas and Romain Bardet who would prove to be the three best climbers in the race. It was a good win by Alaphilippe, as his aggressive but fruitless Paris-Nice taught him to wait more. 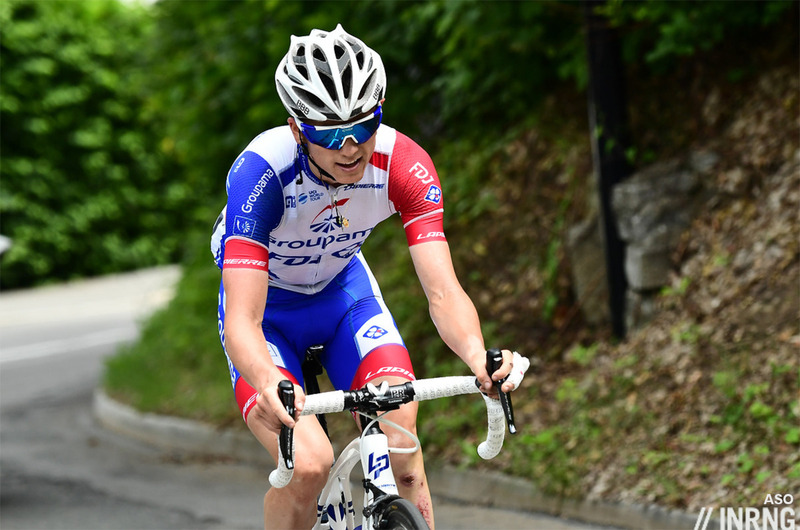 But he’s still challenged by the longer Alpine climbs, as is team mate Bob Jungels. Dan Martin won at Valmorel in his familiar style, pedalling like a chicken pecking at invisible trail of corn laid along the road. It might ungainly but the galline style works and his season is back on track after a difficult start for him and his team. 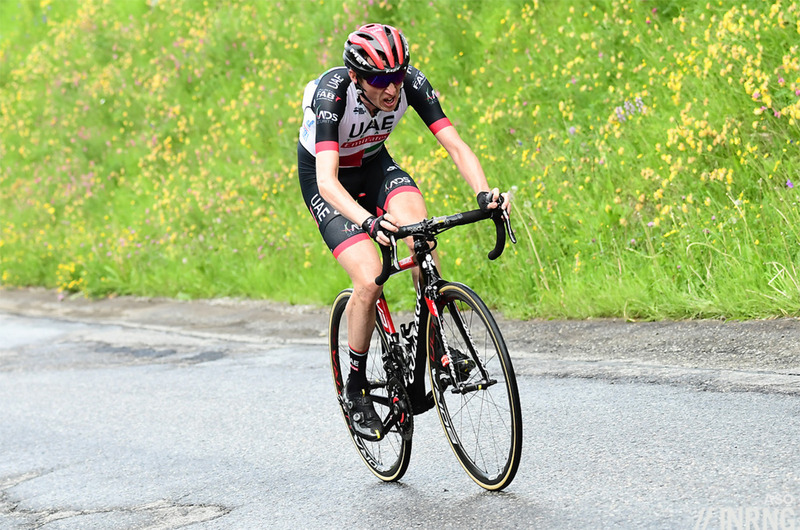 Even if UAE bring bigger engines to the Tour de France they’ll likely lose time in the Stage 3 team time trial leaving Martin with space for more attacks and stage wins rather than a direct challenger for the overall. Pello Bilbao won at La Rosière in the Tour de France copycat stage and the final climb worked out just right for him, not so steep as he had to use a small gear and he powered up the climb. 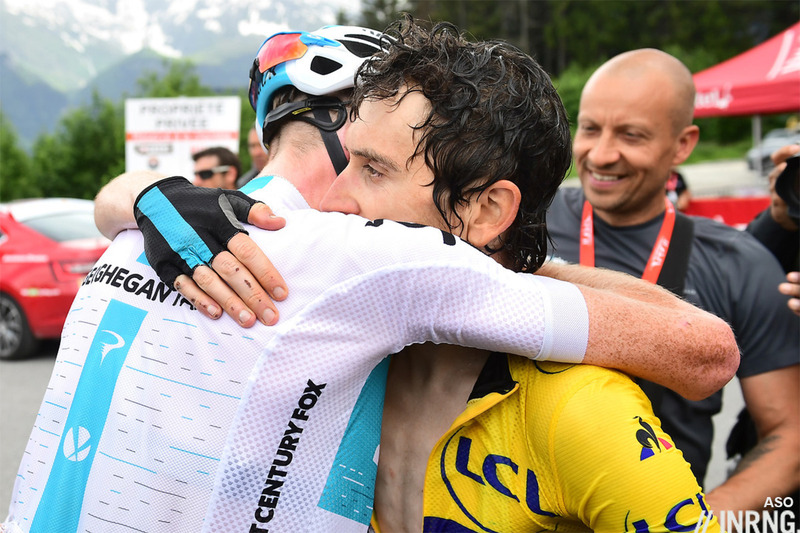 Geraint Thomas did the same in the final metres to take more time. 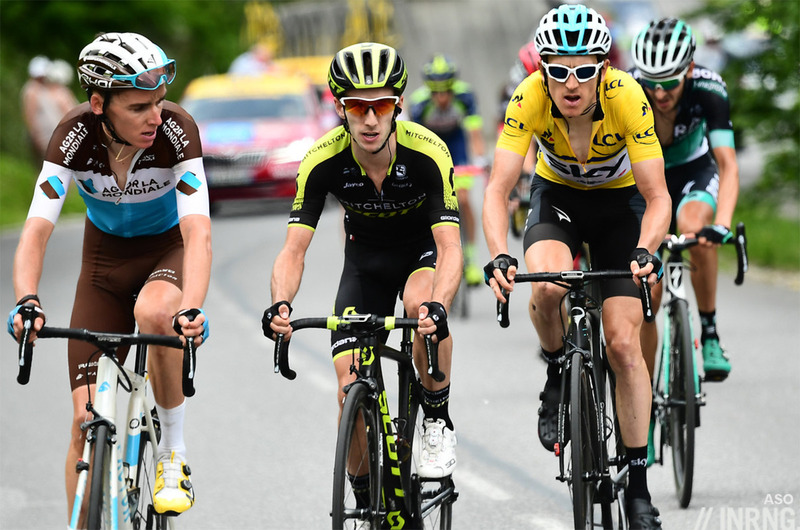 The next day though Thomas found the climb to Le Bettex a little harder when Bardet and Adam Yates distanced him: was this climb too long and steep or was he paying for his chase after a puncture on the descent of the Col des Saisies? Either way it wasn’t an invincible performance even if he still took time and time bonuses on two of the three Alpine stages. Yates won the final stage with a late attack to surpass Dani Navarro in the final metres, a blow for Cofidis but the team is looking refreshed under new management. Many races get seen in the light of another event: we watch the Tour of the Alps for clues about the Giro; the E3 Harelbeke for the Tour of Flanders and so on. It can mean denying the pleasure of the moment, stopping us from enjoying the action because instead we wonder what it signifies about events to come. Yet the Dauphiné cultivates such extrapolation. It copies stages like the one to La Rosière and mimics others, notably the 35km team time trial, the same distance as Stage 3’s TTT around Cholet. Inevitably the first question is what next for Thomas. The Dauphin in France has long meant the crown prince and a label applied to a junior hoping to take over the top job. Is Thomas Froome’s dauphin? Winning the Dauphiné is necessary but not sufficient, we know he can win one week stage races as he’s won Paris-Nice and the Tour of the Alps among others. 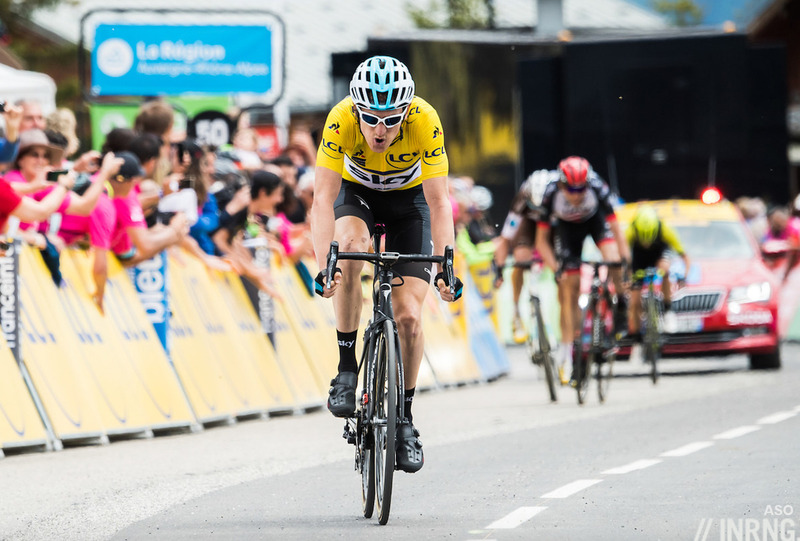 The question is how he can cope over three weeks, whether by misfortune or mistake he’s yet to finish a grand tour as a contender, his best career performances in a three week race are two fifteenth places in the Tour de France. These were achieved riding in support so with a team behind him he should be able to move up. Still he’s 32 and Sky are already looking to the future with Egan Bernal, Pavel Sivakov and more. One big hope delivering is Tao Geoghegan Hart. 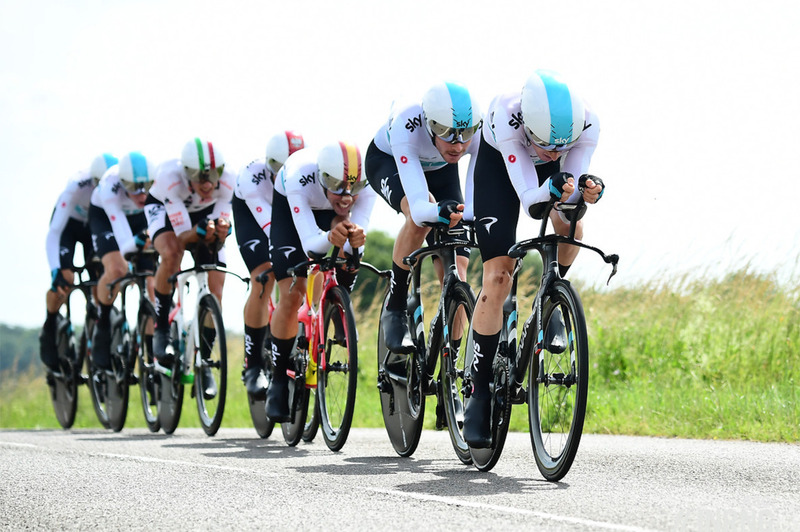 The team were a big help to Thomas, he had a large cushion to recline on after the team time trial and initially surrounded by Michał Kwiatkowski and Gianni Moscon who each wore the yellow jersey midweek. Geoghegan Hart had an enormous week and hopefully by now people can learn to say his name… although many still struggle to say Kwiatkowski. TGH was invaluable in the mountains for Thomas, just out of the U23 bracket but already looking first division material, both on the bike and off it, always capable in an interview and now on an Alpine ascent. Another big helper was Pierre Latour, winner of the best young rider competition almost by accident after spending much of the Alpine stages opening the road for Romain Bardet. Latour’s lumberjack style looks like he’ll implode any minute but he was riding at the front late into the stages. Like TGH he’s promising and an intelligent and amusing personality. Latour led the charge for Bardet who had a good race, finishing on the podium as expected but handicapped as ever by the time trialling. 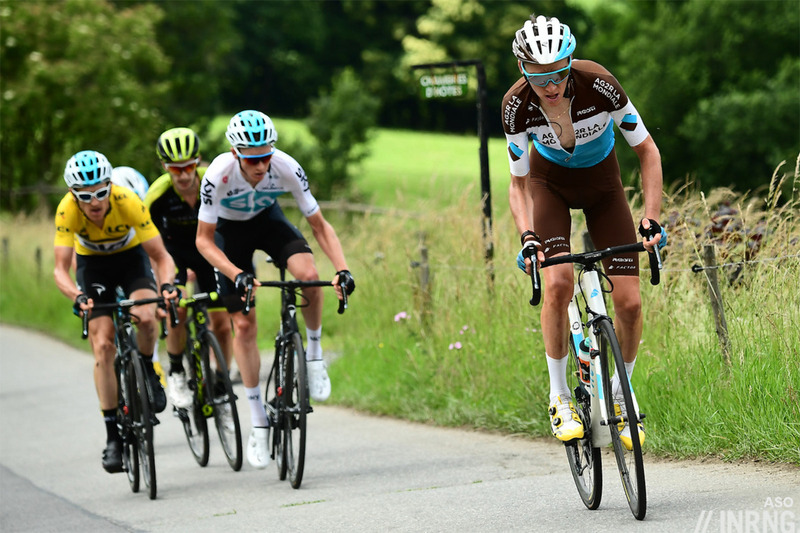 But this was an improvement on last year in the Dauphiné where he lost beaucoup time in the 23km TT to Bourgoin Jallieu and visibly taking the wrong trajectories. It was a good week for Bardet and Ag2r La Mondiale but still left him and them without a result – along with Dimension Data and EF-Drapac they’ve yet to win a World Tour race this year – although they’ll sign for this because perhaps Bardet could have taken a summit finish if he was, say, as far down as Dan Martin. Adam Yates was second overall and took a stage win, everything is on track for him and Mitchelton-Scott although unlike Simon he’ll have to share a team with sprinter Caleb Ewan which means a different allocation of resources but he fared just fine. Among those with work to to Vincenzo Nibali stands out. There’s time for him. He was out of the picture in the 2014 Dauphiné but still top-10 in the mountains and overall, he’s was much further down this week and in a race with less competition. Ilnur Zakarin too was thereabouts but in the past has matched Nairo Quintana in summit finishes at the Tour de Romandie. Jungels was cited above, he’s still working on becoming a grand tour contender but was dropped from the front group on the more gradual ascents. Warren Barguil had a bad time of things too but told French TV he hasn’t been to the mountains yet so while others camp atop Teide for weeks he came to the Dauphiné to work on his mountain pedal stroke and looked better by the end of the week leaving him and his team more optimistic for July. Marc Soler didn’t deliver a result but was aggressive in the mountains, perhaps not a fourth prong for Movistar’s El Tridente but probably enough to have rivals cursing about fork this and fork that come July. Meanwhile we’re still waiting for Gaudu, the Groupama-FDJ rider is a contemporary of Egan Bernal and possible future rival but crashed on the stage to Saint Just requiring surgery and nine stitches to his hand and presumably antibiotics so we’ll have to watch the Vuelta to see what he can do. This year’s edition wasn’t a vintage one for suspense, the TTT took this out. The race’s attempt to offer riders and teams preparation for the Tour de France denied viewers a closer contest. In recent years this blog’s retrospective of racing would pick a stage from this race but probably not this time. Not that it was a parade nor dull, just not the edge of the seat action with the overall result in play until the final metres like last year. Some of the big names were missing this year too. Several are now in the Tour de Suisse from where we can soon begin further extrapolations. There’s also the Route d’Occitanie (ex Route du Sud), coming up where we’ll see Alejandro Valverde in action but no Rigoberto Urán whose second place in 2017 was a clue for July. Now all roads lead to the Vendée and the start of the Tour de France and the wait begins, quite literally because after this weekend there’s a three week period with little racing beyond the 2.1 Adriatica Ionica Race and the national championships weekend. Can you clarify, Inner Ring please, how many riders count for the Tour’s TTT, is it 4 from 8? Yes, time taken on the fourth rider. And does that time then apply to the whole team, or just those four riders? That is, could (theoretically) AG2R drop Bardet during the TTT but he still get the same time as the first four riders? Each rider who finishes with (or, for some reason, ahead of) the team gets the time of the 4th rider. Riders who finish separately behind the team get their own time. Just hose 4 riders. A simpler way to look at it is all those finishing together get the time of the 4th rider.if there is a gap you get your own time. If it was just the TTT then Kwiatkowski or Moscon would have won ahead of Thomas. They’re just helmets and riders can have them with any custom artwork or national flags etc they want, whether for a TT, TTT or a plain road race too. Yes. It was mentioned on UK TV coverage that the UCI doesn’t like ITT national champions wearing national skinsuit in TTT. This year’s World Championships will be the last to hold a TTT for trade teams. National helmets is a nice touch IMHO. I didn’t say it was just a TTT, but that is where the race was won. With that, there was really no contest for who would win. Without it, who knows what would have happened: other protagonists might have had more impetus to challenge Thomas, whereas as it was it would have taken far too much energy in a pre-Tour race. In a grand tour, the amount of time taken in a TTT of this length will certainly be meaningful, in a week race it’s pretty much decisive. Perhaps you could start your own blog? Perhaps you could start your own blog where you suggest other people start their own blog? “Waiting for Gaudu”. Nice! Don’t get many Beckett references in cycling blogs these days, chapeau (as ever)…. You missed Matt Stephenson’s ‘Gaudu only knows how he made it’ when discussing the fact he fish tailed at one point then?! Ha! I missed both of those. Chapeau! Some races can be about as painful to watch as a Beckett play. Let’s hope the Tour is more interesting and less about the theatre of the absurd. Then again, it might be the Endgame for some. I think one thing we can extrapolate from the Dauphine is that, in terms of entertainment, having quite a long Team Time Trial is going to be a mistake. Certainly having it so early anyway. From then on Sky are going to be in total control of the GC and will be able to ride defensively and smother the race, which they are extremely good at. I suppose the hope is that Dumoulin is still able to contend even with the Giro in his legs, and Porte sticks it out for the whole 3 weeks. Otherwise Froome’s biggest rivals will be fatigue, and Thomas. In that order. Before anyone lays into me that isn’t a criticism of Sky, they’ll just be doing what’s needed to win as anyone else would. I’m not sure that is necessarily the case with Team Sky. If you recall the TTT at the Tour a couple of years ago (albeit it was quite lumpy) Sky, Movistar and BMC all finished within seconds of each other. If Movistar were to match that feat this time around, that might set the race up beautifully for the mountains. If Froome is sitting in Yellow by, or after the TTT, he’s totally there to be shot at. Even more so after his Giro exertions. A collectively aggressive approach in the mountains by the other teams – I’m thinking principally here of Movistar, Ag2R and BMC and add in others like Nibali, Martin, Zakharin and Yates – and the race could go all over the place. It all hinges on Movistar, for me. A good TTT and El Tridente working aggressively and collectively, and the race could be a thriller. Of course, the converse could be a true with Movistar – a good TTT and then go into cat and mouse mode. Not sure Movistar will be the same force in the TTT, given that previous good performances have presumably been helped by Amador, Castroviejo, Oliviera and Dowsett, whereas 3 of the top 4+ riders at the TTT finish this Tour will need to be “El Tridente”, assuming they’re all meant to be GC contenders. It’s very hard to see how the TTT is going to improve the race. Agree with Ecky that it should be more seconds than minutes over BMC, Movistar and maybe even Mitchelton Scott… but even if Sky do lead and go defensive, there is still a massive question mark over how Froomes form will hold up after a tough Giro. And he has to make it through the cobbles first. Don’t rate Thomas’ chance if Froome faulters, despite his win here. Think this dynamic along with the forkin’ El Tridente could make for a very interesting Tour this year. Great to see Adam do a Simon yesterday. A promising sign for him to be right up there at the Tour… But will MS go with the same bonus seconds strategy after the Giro implosion? Of course, Froome / Thomas have the insurance of the individual TT on stage 20 to fall back on. That could be worth a minute – minute and half to the Sky boys. Sky’s advantage is the Tour TTT won’t be nearly so big as it was here. They might not even win the stage. Of course, I say that with reference to the likes of BMC but Sunweb, Mitchelton and Movistar should all expect to be within 30-45 seconds at the very outside. I’m not sure the same can be said for the likes of Bahrain and AG2R though and that puts Nibali and A.N.Other very much under pressure from the off. But we don’t hit mountains until stage 10 of the Tour and so the first half of the race is really about avoiding accidents and not making silly mistakes so that you are still in the game when the real fun starts. I hold out little hope for “El Tridente” because Movistar have had multiple cards in the past but their innate conservatism always has them like dogs biting their own behinds rather than those of their opponents. And remember, most guys in the Tour have never won a grand tour or even got a podium. and so for them it counts as a real achievement (as others have rightly reminded me recently). Its all very well to paint pictures of daring attacks and do or die raids but we need to remember how rare they actually are and how much rarer it is that they actually pay off. Remember last year’s Tour? Everyone was marking time hoping for others to fall away. Some, of course, can afford to do that because there is an ITT on stage 20. Its those who need to be out of range by then who need to find their plums and give it the beans. With what you and I have written in mind if Richie Porte is ever going to win the Tour then it’s this year. BMC should place him pretty well out of the TTT and his ITT should be better than everyone bar Froome and Dumoulin. Those two have done the Giro and he’s barely raced so should be as fresh as a daisy. If he puts it together over 3 weeks he should be the best placed to pick up the ball if Froome and Dumoulin drop it. I personally don’t expect Dumoulin to be able to stay in contention. Dumoulin seems to have recovery issues. It wouldn’t surprise if he starts with a public “see how it goes” attitude only to become a stage hunter. Anyone backing Porte is simply gambling. The odds favour something going wrong and he’s older than Froome so if age is a factor then why Porte? My view is his best chance was last year but he couldn’t keep off the grass and on the road. Anyone can see he is a nervous descender. Perhaps Froome’s best quality is his powers of recovery. How else can you win three in a row and probably be the favourite for the fourth nevertheless? In the end, its all about survival. Dumoulin says he’s there to learn and experience the TdF. I’m sure he’ll try his best for a good GC, but I wouldn’t be surprised if they also keep Kelderman as a backup (who could be fairly satisfied with a top10). He’s a promising rider as well and for him the learning experience could be just as important as it is for Dumoulin. I think Sky biggest advantage is that is one of the few teams that can have riders that can ride both the mountains, the TTT and the cobles. Specialy with 8 riders, this will be valuable. GT, Moscon, Kiato, will be a big help in all three courses. The other teams will have to pick specialists for one or the other. BMC may be the only one that can also have some quality on all 3 terrains. Will be intersting to see if Movistar will wait for Landa. indeed… although I think that V and NQ have figured it out well in the past. L is the new variable here. I wonder what they offered him to come to Movistar and how much entropy he will create. I guess after stage 3 (TTT) we will have a good idea of how protected Landa will be. Although is an ondulated course, I dont see how L can keep on with the top 4. He may loose >2 min right there. Is ML any worse than NQ in a flat time trial? I’m increasingly impressed by the pecking chicken If he hadn’t broken his back last summer while riding for a team that didn’t much care for him I do wonder what great things he might have achieved. Agreed he was very good last year and given he lost a bunch of time and broke his back realtivley early on it was a great result. Not sure unless he managed to break away from all the main contenders I put a minute or two into Froome though that he would have won. Ha! Love the description of a Dan Martin attack! I can imagine myself come the TdF having a little chuck if he launches an attack. can I just say I see zero chance of Sky taking either Bernal or TGH to the Tour. Neither have raced longer than 10 days or so (and the mountains are packed into the 2nd half of the TdF). Sky have plenty of proven options in Henao , Rosa, Lopez, De la Cruz etc. No way will they risk these guys despite the hype and promise shown. Vuelta for both I’d think. You’re going to Bernal your matches saying that. I know I am a snob – and a snob who cannot pronounce half the riders’ names correctly – but I find that I cannot listen to English language commentators because they mangle the names so horribly and make all but the more well-known names incomprehensible. I am a spoiled brat as well because the Swedish and Finnish commentators are fluent enough in all the major cycling languages and make the point of learning the pronounciation of those names they are not familiar with. TGH said he has no plans to go to the Tour, he is targeting the Vuelta. Egan Bernal has been mentioned in various provisional Sky Tour rosters but he was at this race too. Whether he will ride is not clear, seems a bit of a risk especially with the TTT & cobbles. Nebbich. Bernal wasn’t at this race. +1 Then there’s the guy who rides like he’s pushing a shopping cart uphill while cradling a cell phone on his shoulder. Where have all the stylists gone? Have efficiency and aesthetics ever been this far apart? Larry, personally I prefer watching riders with all the style of a bag of dirty washing on a bike. It makes me feel better about my risible efforts whenever I go over anything bigger than a speed bump. Also makes me feel that they are actually suffering. Nibali, Valverde, Kwiatkowsi and many others have style. Well, those guys at least are not awful though of course back-in-the-day there were guys like Escartin, nicknamed “The Crab” and even Sean Kelly looked rather ungainly, caused (they say) by riding bikes of the wrong size early in his career. I was thinking about guys like Moser, De Vlaeminck, etc. Men who looked great on a bicycle. Tom Boonen was one as well. Poetry in motion. Who else out there looks that good? I’d say a lot of the Italians but even too many of them look awful these days. I wonder how much of the current thrashing around comes from starting on MTB’s? Aru is one example of that for sure. Or perhaps it’s that when they need to be “aero” they’re splayed out on a crono bike where so many of them look like a cat trying to wipe its a– on the carpet and nobody ever works with them on that gorgeous, classic “flat-back” position in the drops the coaches used to beat on us to emulate? Two that look great and have very similar styles – Luis Leon Sanchez and …. Moreno Moser. I may be wrong, but it seems to me that riders have their saddles higher relative to the bars nowadays, so that the tops now are where the drops were back in the day. I guess it depends on what you mean by “nowadays” as I remember an Italian mag taking photos of Coppi and Contador, sizing them identically using the wheel size and tracing the contact points/position. They were almost identical. One thing about “the drops” that HAS changed is they don’t seem to drop so much anymore with so many “compact” handlebars available. I have not ridden a lot of them but besides hating their shape, I find there doesn’t seem to be much difference in body position if your hands are on the hoods or on compact drops. Obviously the pros know what positions are faster, so if the drops made any difference they’d be down on them like back-in-the-day. Escartín was of the lineage of Robert Alban, although Alban was even more exaggerated, because he always used excessive gears. From the “golden days of pro cycling in colour-TV”, also Agostinho, Pollentier, and Fabio Parra had characteristic “ungainly” styles. Freddy Maertens looked fantastic on the flat, but climbed like pushing a Roman plough. I loved your descriptions of these positions Larry but compared to Moser everyone’s position and style is ugly! Eros Capecchi and Serge Pauwels always look smooth on the bike. Kreuziger too. It’s quiet old school to see these riders “pedalling with their ears”, like times of old despite lower gears etc. I thought Geoghan-Hart looked good. He looked balanced and fluid, and his arms were proportionate in length to the rest of his body..! Adam Yates looks about 5 stone wet through. Just out of curiosity, does anyone know if Stage 5 was the first time an Irishman, a Welshman and an Englishman occupied the first three places of a major European stage race? But I do know that there was an Englishman, Irishman and Welshman at a fairground together and they all decided to go on the helter skelter. As a foreigner, couldn’t stop giggling after googling the joke. Apparently, Buchmann won’t ride the tour, but he will lead Bora-Hansgrohe at the Vuelta. So no problems with Majka at the Tour. This is the source. It says, the ‘Classics-like’ first week doesn’t suit Buchmann. Ok, thanks. Will update the piece above, I suppose it suits the team and him to spread resources more across the season. Thank God! Didn’t know who to cheer for a 11th GC position. Where is Uran? Is he doing any warm-up race or is it all Colombia training and home cooking prior to Le Tour? Training in Colombia. He rode the Route du Sud last year but his team are not down to ride that so he’ll show up at the Tour with Liège his last race. It’s big ask to repeat last year’s performance but it looks like the team trust him to do it without having to have a test before. Looks like he’ll be at the tour of Slovenia which features an interesting start list. An insightful and comprehensive analysis as usual (seems to be a good bit longer than the one for the Giro, do I detect that INRNG was not too enamoured of the result there?). Geraint Thomas was the strongest rider in the race, even taking out the TTT he would have still won. The only moments of weakness came at the beginning (though recovered very well) and in the last few hundred metres. He rode a “mow em down in the chrono, hold em in the mountains” strategy, popular with many around here :), which has proved so successful for many others and proved again here that it works. If Adam Yates can be talked up as a Tour prospect on the basis of winning one stage then the overall winner must be too. I have doubts over either though, we have recent experience of a Yates riding away on steep finishes and, as INRNG says, G still has questions to answer over 3 weeks. 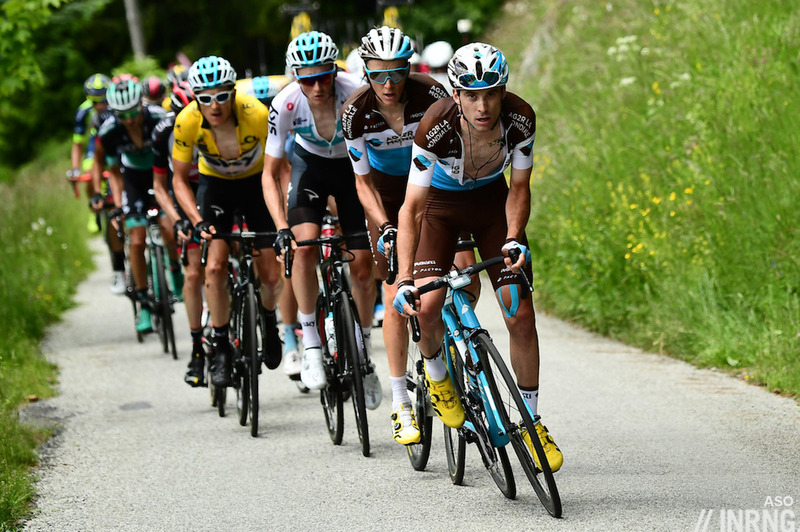 Whilst it is clear some treated the race as a training exercise (V. Nibali) I think Romain Bardet rode to win. He did not even really come close, dont think that bodes well for him in July. Not sure the course really worked this year. No proper sprint stage, TTT of limited interest, 4 consecutive mountain top finishes didnt really work out. I am not convinced about short mountain stages, the excitement feels rather forced, you can have too much of a good thing . A more traditional route featuring longer stages and perhaps just one or two mountaintop finishes might have been better. Far be it for me to speak for INRNG but the brevity of the Giro “moment the race was won” was surely due to the obvious way that race was won ? Impartiality is another strong point of this blog. The Giro piece was 2000 words, making it much longer than this one. Obvious not proportional to the race but the piece above includes plenty of forward looking aspects about July too. I wasn’t impressed with the short mountain stages either. They seem to be flavour of the month with ASO at the moment but they didn’t bring anything, they just played out like shorter versions of ordinary stages. I suppose it’s ok in a prep race if you don’t want to be knackering everyone out for the main event but I don’t want too many in my Grand Tours. A pretty dull and forgettable Dauphine. ASO is going to have up their vision if their courses are to stay on top of the game. A pretty weak field and an early TTT that pretty much decided the overall GC order. Mountain top finishes where SKY seemed to forget there are tactics other than churning along on the front, when defending against weaker riders. Several last kilometer efforts were the sum of the real racing. If G performs tactically or his legs fail to respond as they appeared to do when his closest GC competitors went up the road far to late on the final stage, his three week potential is limited. I have to say I quite enjoyed this race. I liked it that the main protagonists were still duking it out till the very end. The Dauphine is never one for huge surprises. There can be wild swings on the GC (which didn’t happen here) but some of the riders were on top form, whereas quite often you get riders coming into form and so you see riders pulling their punches. G and Martin were properly swinging at each other in my opinion. Yes the TTT had a significant effect in stabilising the GC, but it wasn’t the decider. Bardet finished 1.47 down on the winner. He lost 1.30 of that in the TTT. How is that not a decider? Well, as you point out, had there been no TTT he still would have lost. That’s not how it works: you can’t just subtract the time from the TTT and then work out who would have been the winner. If the gap is 10 sec instead of 1.5 min people then ride differently. That’s not how it works either: you can’t just subtract a stage from the race and then work out who would have been the winner. If the stage is an ITT then people ride differently and Thomas probably gains even more time on Yates and Bardet. If the stage is en ligne then ASO probably design the last 4 stages differently. I never said you could work out who would win. So I’ve just realised why Geraint Thomas – lately known as Thomas de Gwent (sort of) – is calling himself co-leader for the Tour. It’s all to do with that renowned Sky planning. They’re aiming to get him on the second step of the podium just in case the leader/winner finds his recent results get scrubbed from the record books…Maybe. Or perhaps that’s as ridiculous as Thomas de Gent winning the yellow jersey! Calling himself co leader to take some of the heat and press coverage from Froome so he can have an easier ride? Lots of different scenarios can be envisaged for the active imagination. Assistant Regional Manager, or Assistant To The Regional Manager? Only time will tell. Cofidis deserve a break. They have some really good riders and a great team spirit even if Nacer Bouhanni is an odd fish. So felt for Dani Navarro at the summit finish. I don’t like Thomas. It’s all the interviews I’ve seen with him. I also don’t like the way he is made to be something else than he is, a domestique. As mentioned, he never made the top 10 and some regard him as potential winner or as second to Froome, just in case the latter gets punished. He is not GC material and I so hope we get over him soon. If he gets to finish first one must imagine the most boring of Tours. That’ll be a double Olympic gold medal winning, Paris-Nice winning, E3 winning, Dauphiné winning domestique. I don’t think there’s enough evidence to take a view on his GC potential. I can only think of 2 or 3 stage races where he’s been undisputed leader. Talking about riding styles, this year we had Froome, Pozzovivo and Aru in the same shot many times. Have Kirby commentary with that.